What do you say to Mickey? 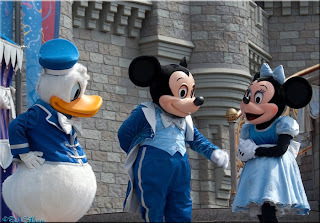 | Focused on the Magic : What do you say to Mickey? What do you say to Mickey? Guests who visited The Magic Kingdom yesterday were in for a rare and special treat! Mickey spoke his first words to a select few guests visiting him backstage at Town Square Theater! The excitement in the queue must have been palpable! I so wish I was there to experience that magical moment! I wonder what I would say to him?! I'd probably ask him a question...but what? What would you say to Mickey if you were there last night? Love that they are testing Mickey at WDW! I wonder if any kids are freaked out by it? Wow, I really wish we could have been there! I do wonder if my daughter would have been excited or shy, though. I know, I wish I could have at least been a fly on the wall. Would love to hear the conversations. I sure hope they bring out talking Mickey in January - my son would melt! That would be so special! I can't wait till they make it permanent!